Arsenal manager Arsene Wenger has confirmed that left-back Kieran Gibbs will miss both legs of the Champions League tie against Bayern Munich. 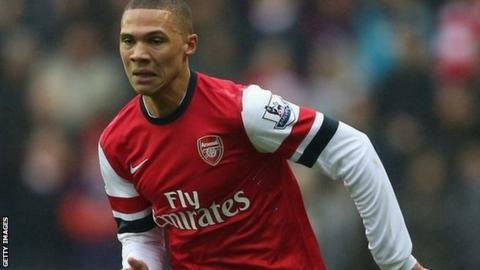 Gibbs was injured in midweek against Liverpool and had initially been ruled out for two to three weeks. But Wenger says it could now be up to two months, leaving him a selection dilemma at left-back with cup-tied for the games. "I will not tell you who will play there," said Wenger. With his options limited, Wenger could be forced to play the much-maligned Andre Santos in that position. However, Wenger has backed the Brazilian and believes criticism of him is unfair. "Andre Santos does have a future at the club," added Wenger. "He lacks competition and he needs competition because he is not a nervous type of player. "Yes (I do think the criticism is unfair). The first critics after the Liverpool game are a bit emotional but when you watch the game again you will see he has done some good things." Wenger says he is delighted to have sealed the signing of Monreal, who he believes can adapt to Arsenal's style of play. "Our scouts have followed his progress for a while," said the Frenchman. "We had the blow with Gibbs's injury, which is longer than we thought. We expected two to three weeks, it is going to be four to six, so we were in a position where we had to act quickly and that explains our buy. "We bought him as a left-back but he can also play as a left-sided midfielder. We believe he can integrate into our style of play and adapt very quickly. "I believe we need two left-backs anyway. We cannot play with the same player every game."